Most people get confused when they are pairing wine and they don’t understand where they should start. They get stuck between whether they should pair food to the wine or they should pair wine to the food. 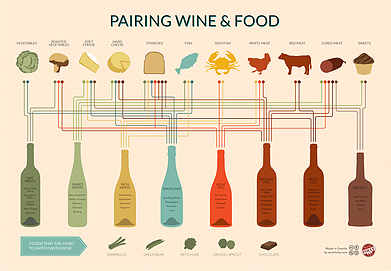 I agree, it can be a little confusing when you don’t know a lot about food and wine pairings. Frankly, it is a fair shake. You should start with whatever inspires you more, whether it is the wine or the food. Always remember, “Cooking is basically a proper balance of acid, fat, sweet and salt.” So it is the balance that really matters and what you start building your meal around does not really matter as much. Having an idea of regional wine and food pairings is quite essential but one must also know that regional matches are not always the perfect food and wine pairings. However these regional and traditional pairings help in providing us a rough template, so that we canunderstand the structure of food and wine pairings a little better. There are no such practices that can really be called wine and food pairing mistakes. It is just that some of the wines tend to work better with certain kinds of foods as compared to others. Experimenting gives you a chance to find out whether a pairing is up to your expectations or not. If it is not as desirable as you were expecting it to be, you can always go with a different pairing the next time. This way you will eventually find a pairing that you love. Most wine enthusiasts and experts advocate people to return to the open bottle post meal and take pleasure drinking it on its own or paired with something. Acidity in a wine matches up well with sweet and fatty foods. Fatty foods usually need either a high alcohol or an acidic wine; or else the wine will end up tasting flabby. Bitter or tannic wines can be paired with a food that is more on the sweet side. Salty food should not be paired with a wine that is comparatively more acidic. Sweet foods benefit from lesser acidity in a wine. If you are looking to cut through foods that are rather fatty or are looking to balance a dish that is sweet, alcohol is the answer. Order and enjoy our Chianti Classico, Chianti Classico Riserva, Torre Di Montemaggio, Quinta Essentia Di MonteMaggio IGT, Chardonnay di Montemaggio IGT or Rose Di Montemaggio.